Halo-halo is a popular sweet summer, refreshing dessert among Filipinos. Halo-halo recipe is mainly a mixture of sweetened preserved fruits, evaporated milk and crushed ice. Selling halo-halo during summer season is common for most local households. And, because it is considered one of the best refreshing desserts in town, many Filipinos found a fortune in halo-halo business. One good example of halo-halo business success story is from Rita Zaguirre who inherited a trademark made popular by her grandmother over the past 70 years- Aling Taleng’s Halo-halo. Their halo-halo business was started in 1933 in Pagsanjan, Laguna by Catalina Zaguirre, Rita’s grandmother, who started a halo-halo store in front of their house with only P10 as capital. Their customers, mostly neighbors, kept on coming back as they found the recipe of Aling Taleng’s Halo-halo to be different from all the others. Apart from traditional halo-halo, they combine different ingredients: kaong, leche flan, mongo beans, macapuno, sugarcane bits, kondol and ube. One can have a tall glass of refreshing halo-halo with seven ingredients in it, which they consider the secret of the family’s halo-halo business success. Another halo-halo business success story is from Razon’s halo-halo. From a small eatery in Guagua, Pampanga, Razon’s has now become a growing chain of restaurants. In the small subdivision inside the town, during the late 1960s, they introduced the most simple but incredibly delicious halo-halo in town- the famous Razon’s halo-halo. What’s stunning about Razon’s halo-halo is that it is only composed of three main ingredients: leche flan, macapuno and saging na saba. But still, a lot of customers compliment their halo-halo recipe because of its softness and creaminess that melts easily in your mouth. This is probably the secret why Razon’s halo-halo became more and more popular. 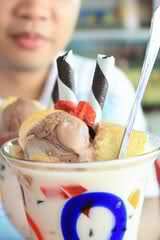 The third Halo-halo business success story is from a young businessman Xavier Mercado. From tending a halo-halo stand 10 years ago, Mercado is now managing a restaurant built on a secret Ilokano recipe for the sweet summer concoction that Filipinos love- Halo-halo. Armed with nothing but his love for his childhood treat and the support from his friends, Mercado opened his restaurant, Halo-Halo de Iloko, in 2004. His secret why his halo-halo business is a success is his passion for halo-halo. Mercado would personally cook the ingredients at their home. Then these are delivered to the restaurant. However, Mercado did not reveal the secret to his halo-halo ingredients which will remain a secret to the public. – Be creative and innovative to open up fresh ideas. – Position your halo-halo business in a high density areas like near offices, schools, and residences. – Make your prices affordable for the masses. How to Make Halo-halo. Try this delicious mouth-watering halo-halo recipe. Most of halo-halo ingredients can be found at your local supermarket or you could even make your own unique halo-halo recipe. Do you like this Money making business ideas? then please consider subscribing to our PINOY BISNES RSS feed. You can also subscribe by email and have new business ideas sent directly to your inbox. (Once you entered your e-mail address, you need to login to your e-mail account and click the link to confirm your subscription). I have halo halo street bussness in q. C e, rod corner p. Paterno dona aurora.. The best among the best..
wow I'm planing to make it now so sarapppp…. I love it! looks delicious….yummyyyyyy! I try this.. so good!